an exciting, dynamic activity ! 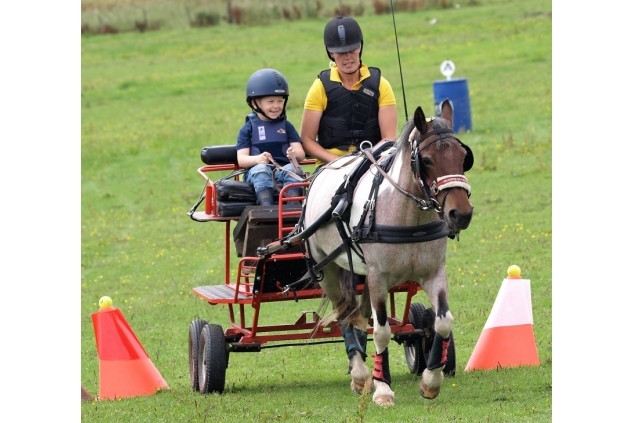 Sports Driving Unlimited provides opportunities for people of all ages with impairment, terminal illness or who are disadvantaged to take part in the exciting and challenging sport of pony driving. We operate across south west Scotland, Cumbria and Lancashire and are unusual in that we can involve whole family groups in our activities. Our enthusiastic professional trainers are skilled in encouraging each driver to get the most out of the experience and grow in confidence. We provide unique opportunities for people with impairment to enjoy a thrilling, therapeutic activity with ponies - blending the exhilaration, excitement and adrenalin rush of carriage driving with the expertise of developing individual confidence, motivation and achievement. Through active involvement people with impairment can benefit from a tremendous increase in self esteem, confidence, motivation and achievement; all vital in helping them cope with the challenges of everyday life. Our success can be measured by the demand that continues to increase. Most of the people who try sports carriage driving want to continue and develop more skills. Every week people with a wide variety of different impairments attend sessions at the driving centre come rain or shine; the weather never puts them off! They experience improvement in motor skills; increase in confidence and mental well being; increased ability to learn and absorb new skills; improvements in core muscle tone. We welcome volunteers who have some experience assisting and supporting people with impairment. Previous experience with ponies is useful but not essential as we will show you how to handle the ponies and carriages. Our sessions take place on different days of the week, mostly at Boreland near Lockerbie but also at equestrian centres near Carlisle, Wigan and Stranraer. We have a volunteer recruitment process which asks for personal details and 2 references, please contact us for the pack.